The winning team from Australia travelled to Wellington for the two-hour butchery competition and were determined to take the title after losing to the Kiwi side in the last three international showdowns. This was the first time the current New Zealand team have worked together to present a world-class display of value-added products from a selection of beef, lamb and pork cuts. Head judge and founder of Hellers, Todd Heller said although you could cut the tension with a knife, the two teams have together achieved something incredible for the industry. “These talented butchers are using innovation and creating products that we’ve never seen before; the fact the competition is so fierce forces these guys to push the boundaries and test their creativity,” says Heller. 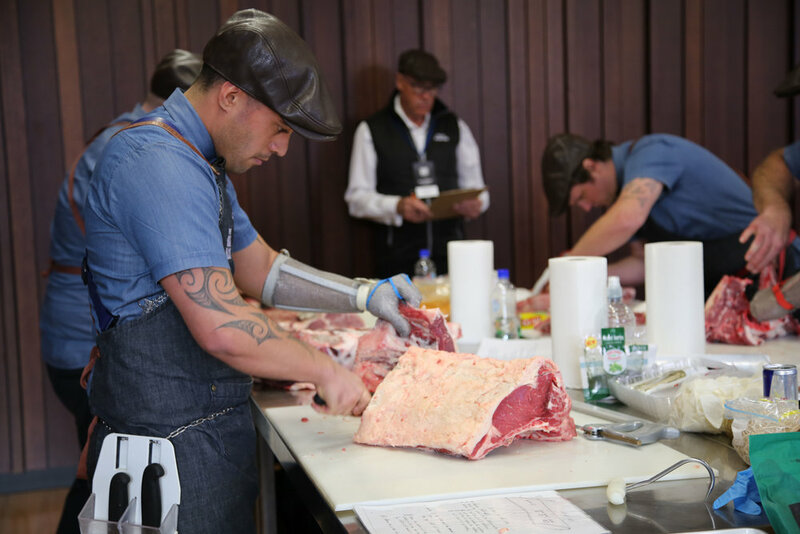 The Trans-Tasman event also gave the butchers an opportunity to fine tune their skills ahead of the biggest international butchery competition the world has seen, the World Butchers’ Challenge to be held in March, 2018 in Belfast, Ireland. Pure South Sharp Blacks team captain, Corey Winder says even though the team missed out on the win this time, they’ll be back stronger in Ireland. “This Australian side featured some hugely talented butchers and I give them total credit for what they achieved today. The bar has been set extremely high as we look towards our next event but as Kiwis, I know we’ll rise to the challenge,” says Winder. Joining Winder in the Pure South Sharp Blacks is Greg Egerton from Mad Butcher, Dunedin; Jeremy Garth from New World Ferry Road, Christchurch, Zak Grammer from New World Eastridge, Auckland; Hannah Miller from A Lady Butcher, Auckland and Hohepa Smith who currently works at Gold Coast Organic Meats in Australia. The Pure South Sharp Blacks, sponsored by Pure South, Beef + Lamb New Zealand and New Zealand Pork now face an intense training schedule, working alongside industry influencers and chefs in preparation for World Butchers’ Challenge in 2018.